Data is one of the most valuable assets of a real estate company. However, it can also cause headaches if data entry is spread out over multiple disconnected systems. This is why using a CRM system makes perfect sense, eliminating double data entry and providing a wonderful experience for the clients. Propertybase, collaborating with The Cliffs and eHouse Studio, showcases an example of what a seamless integration between CRM and website can mean for a business. The Cliffs are a real estate developer with seven private, luxury lifestyle communities within South and North Carolina. Since their former website was outdated and lacked personality they partnered up with eHouse Studio, a professional digital agency with a strong focus on design and user experience. 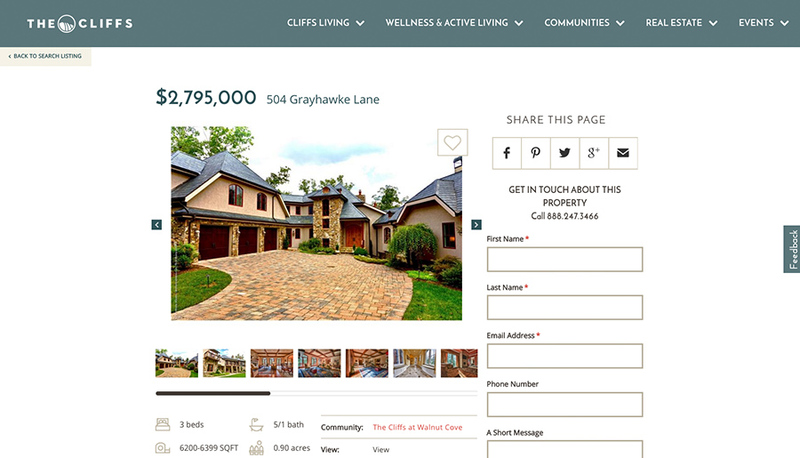 eHouse Studio redesigned The Cliffs' website providing it with a brand new responsive look. 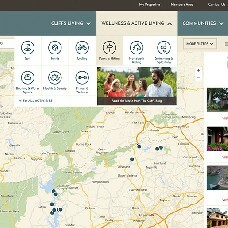 A fully interactive map enables visitors to drill down to listings that fit their needs, gather further detail information and explore the community amenities nearby. In the background, the map seamlessly integrates with Propertybase's real estate developer software and automatically syncs listing information including geolocation and photos. The Cliffs' website won several awards and within just four months created as much leads as the old site for all of 2013. - Save time processing leads and provide an opportunity for lead scoring. - Refresh old branding and update internal technology to track leads and clients. - Drive significant increase in leads from the website. - Reach increasingly mobile audience without sacrificing interface functionalities. - Tell an immersive experience to truly convey The Cliffs story to prospects. - Tight integration of Propertybase CRM with a focus on user experience. - Automated parts of Cliffs' role in purchase cycle using workflows and automated emails from Propertybase. - Brand distillation through content strategy, purchase-cycle relevant storytelling, and digital user interfaces. - Responsive user interface from mobile to large desktops with a consistent focus on UX. - Website on top of flexible platforms with pre-built APIs including Propertybase Real Estate CRM. - The integrated digital body language of prospects through tracking web activities and tying that back to Propertybase. - Increase sales-ready leads with a nicer website and easier ways for leads to engage. - Generate lead intelligence: know what the lead was looking at before calling him and scoring leads that visit more often in order to engage them sooner. - Automate the process of handling leads and following up. - Implement lead alerts and auto-responses to prevent leads slipping through the cracks. - Use reporting to track which types of leads are coming into the site, and how well each category of leads are converting.